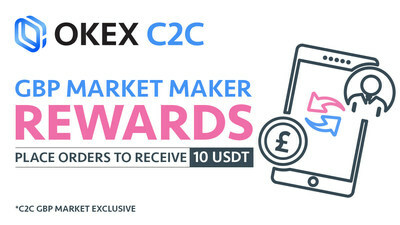 With exclusive privileges, being a designated merchant at OKEx C2C trading can enjoy exclusive advertising rights which include advertising freely and efficient trading, at the same time merchants will be given a verified badge (blue tick), officially acknowledging as a trusted merchant and a dedicated customer service which serves to resolve any issues within the shortest time. Learn more about being a merchant here. Traders can simply place a buy order and a sell order on the GBP Market (any one of the trading pairs). Accumulate more than 8 hours of order placement time within the promotion period. The bonus will be credited to the eligible OKEx accounts by Apr 12, 2019. For promotion T&C, please visit here.